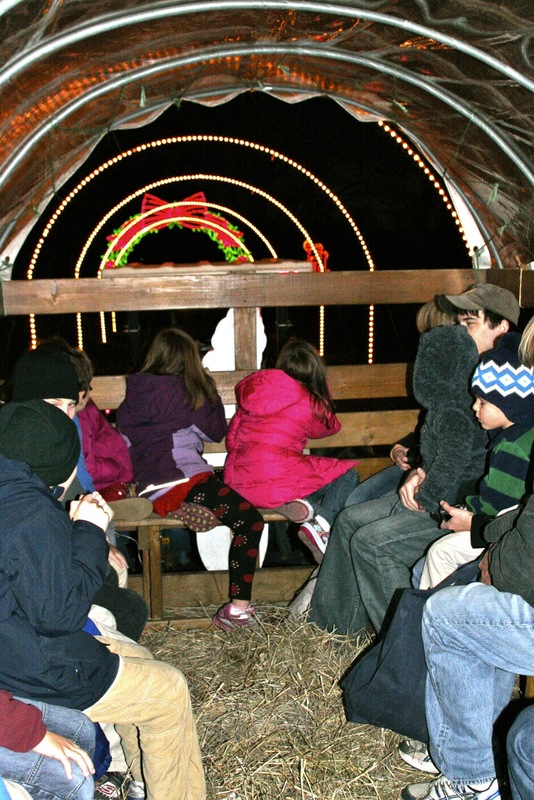 Okay, the other place besides a bowling alley that will take about 30 people for a reasonable price is a hayride. 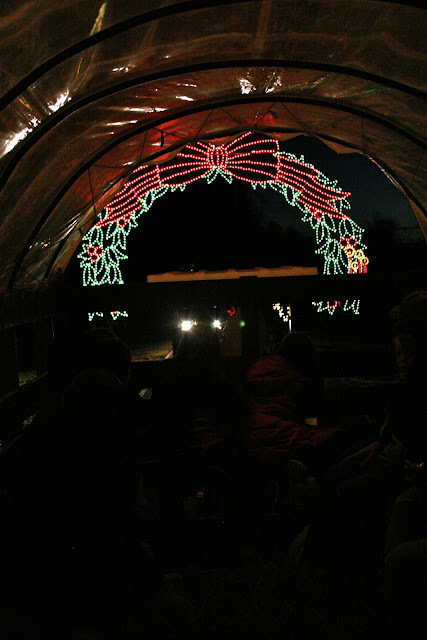 Patsy signed us up for a hayride through the holiday lights at Tanglewood, a park just outside Winston-Salem, N.C.
Our entire crew descended upon Tanglewood in a passel of minivans at sundown Saturday night. Our covered wagon was hitched up to a tractor, and we took a 45-minute ride through the park, oohing and ahhing at all the lights. Just so you know how observant I am, I had to ask Nick last night whether a tractor pulled us, or whether it was horses. That's me: bringing you the finest, most intricate of details from the recesses of my mind. Or whoever's mind I plucked the details from when I forgot them. This was the first year we'd ever driven through the lights in a horse-drawn wagon. In years past, we've always just driven through it in our minivan ... which is also fun, but doesn't allow you to share the experience with so many other people. I don't think there's any kind of rhyme or reason to the things the lights represent ... several faiths are illuminated, as well as things like cartoon characters. We were lucky that the night we went, the skies were clear and the temperature wasn't too low. It was maybe 55 degrees, so our jackets and sweaters kept us plenty warm. Even Amelia was toasty in her striped fleece hoodie and a blanket. 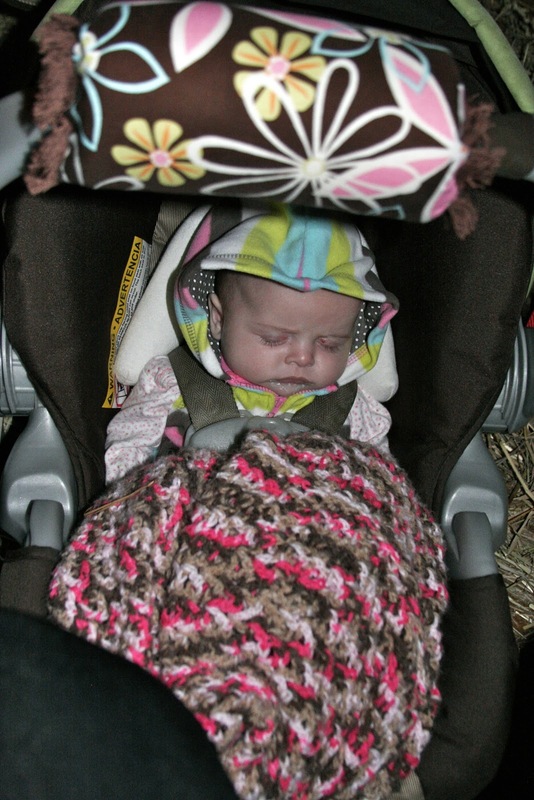 She slept through the entire ride. About halfway through the ride, the kids started singing Christmas carols, and we all joined in. Patrice was the only adult who knew all the words to all the songs. She's really just a big kid, herself. Jake couldn't see very well from his seat in the back, so he moved across the aisle to sit with Patsy and Bill. 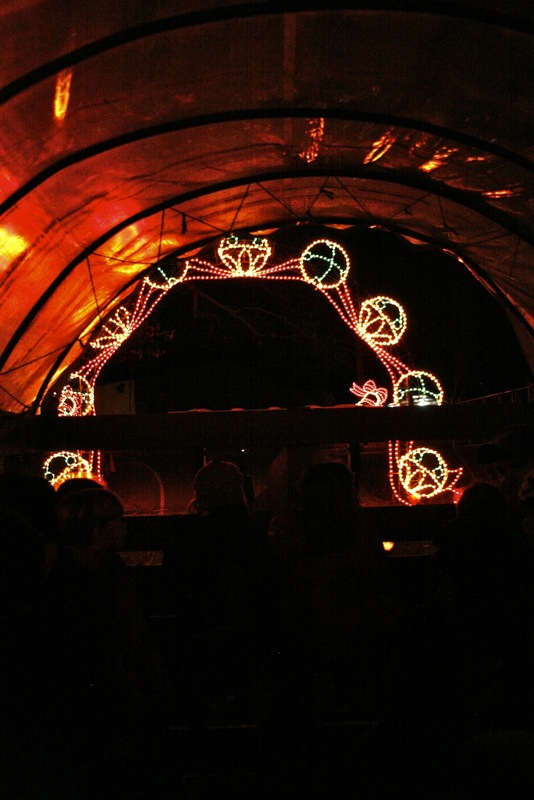 There were several times when the wagon was nearly silent, with everyone just enjoying the lights. 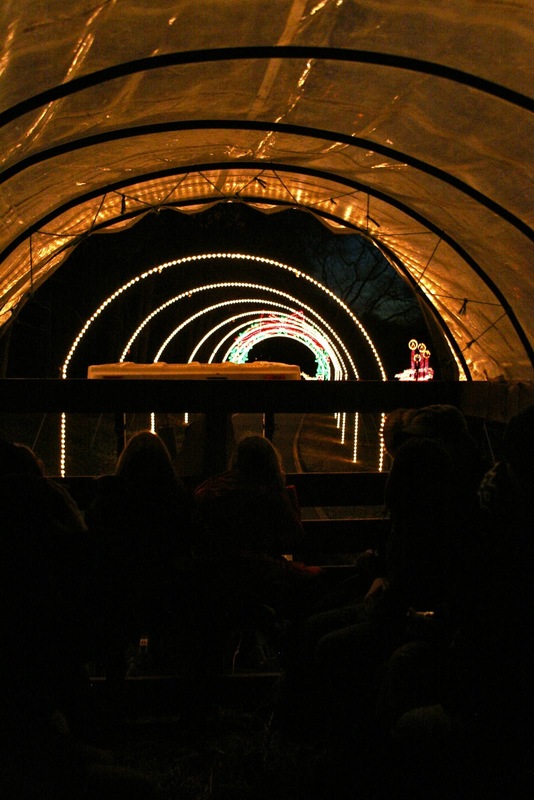 I would definitely do the hayride again, although I realize we got really lucky with the weather this year. In the rain or below-freezing temperatures, it wouldn't be nearly as comfortable. 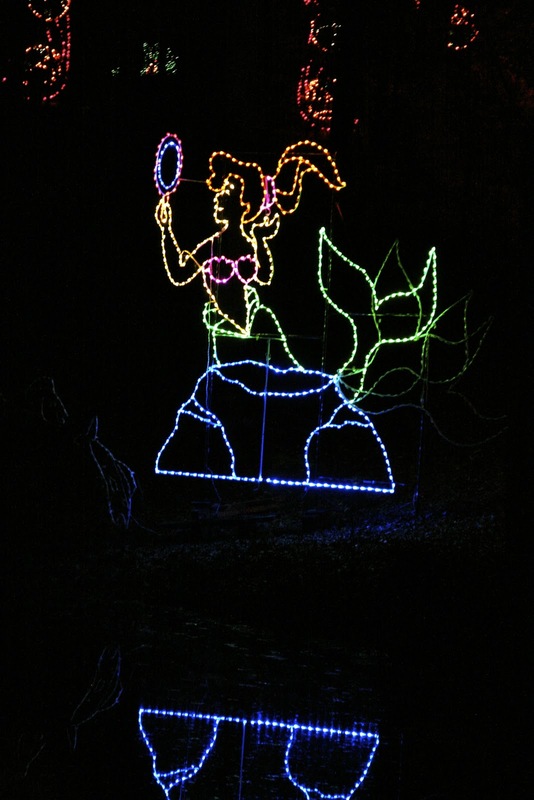 Parts of the ride were so bright that it almost looked like it was daytime! Tiffany and Gary and their kids traveled a long way from Jacksonville, Fla., to be there. And Kim and Andrew drove with their kids from New York. Everyone else lives in North or South Carolina, so the trip isn't as far for them. I'm so grateful that everyone makes the effort to be there, because it's so much fun to be with all of them! 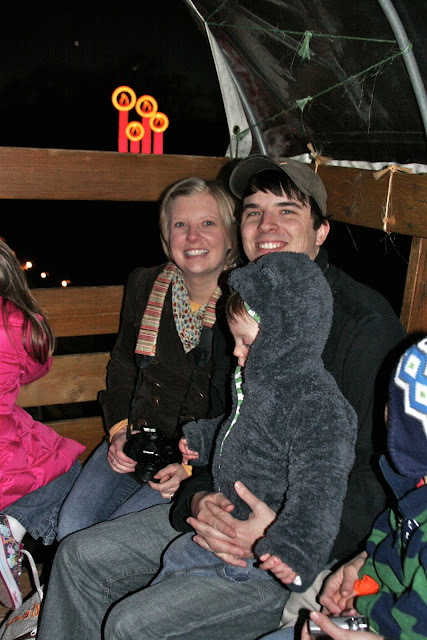 We did the same hayride over Thanksgiving! That's great. We drove through there one year when I was at Wake, and it was beautiful. I think you would have had an added aroma if there had been horses pulling the wagon! It's wonderful that you could share the experience with the extended family. Maybe a new tradition has begun. Did I see a Lockness Santa? LOL! Gotta love kids spontaneously breaking out into carols!